Kuala Lumpur, 19 March 2019 – Vivo is organising their Superday Sale this Saturday, 23 March 2019 for those who have been waiting to get their hands on their latest Vivo V15 model featuring the world’s first 32MP Elevating Front Camera at One Utama Shopping Centre, Ground Floor, Highstreet, New Wing. 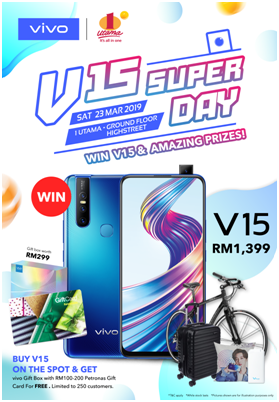 Members of the public are urged to drop by at the Vivo Superday Sale at One Utama Shopping Centre this Saturday, 23 March 2019 where two lucky participants who purchase V15 at the event will be able to win a AI Triple Camera Shoot like a Pro Vivo V15 smartphone. The public is also able to pre-order their Vivo V15 at RM1,399 from now till 22 March 2019 and receive an exclusive gift box RM299 featuring an Octopus Phone Holder, Bluetooth Headphones and 6-month Screen Protection. Smartphone purchasers will be able to take part in fun games like the Claw Machine and Break the GoldEGG challenges when they purchase Vivo V15 and stand a chance to win a Vivo V15 or a bicycle or luggage. The Superday will also feature Vivo’s popular 15 Second Challenge game where the public will stand a chance to win a limited vivo merchandises. The first 50 customers to purchase Vivo V15 will receive the exclusive Vivo Gift Box worth RM299 and a RM200 Petronas Gift Card. Meanwhile, the subsequent 200 customers will receive a RM100 Petronas Gift Card. For OneCard members, they can earn and redeem UPoints at vivo Booth. They can also get a Free Wireless headphone worth RM119 with any purchase. Vivo is a leading global technology company committed to creating trendsetting smart mobile products and services. Vivo is devoted to forming a vibrant mobile internet ecosystem, and currently owns and operates an extensive network of research operations, with R&D centers in the US (San Diego) and China (Dongguan, Shenzhen, Nanjing, Beijing and Hangzhou). These centers focus on the development of cutting-edge consumer technologies including 5G, AI, mobile photography and next-generation smartphone design. Vivo has over two hundred million users enjoying its mobile products and services around the world. Vivo is present in 18 markets globally and features offline retail stores in over 1,000 cities worldwide.